Energetic gladness will illuminate the face of your treasured dame when your this present of Splashy Blush Faux Georgette Saree will reach her home on a normal busy day as a mark of your love for her. 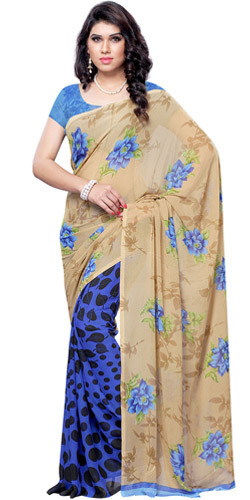 This Saree showcases a Throughout Texture of Dots and Leaves over a Vivid Blue Background and a Clear Brown-coloured Pallu with Flowery Motifs. Flowers Delivery Amravati, Send sweets Kolkata, Wedding Cake Kodad, Diwali Mithai Gajraula, Send Flowers and Gifts to Jalgaon, Online Shop Pathanamattita, Flower to Kanchikacherla, New Year Flowers Hosur , Fresh Fruits Sawai Madhopur, Send Gift Udipi, Dry Fruits to Aligarh, Birthday Delivery Calicut, Sending to Vasco, Flower shop Kollam, Kodad Online Cake Delivery.